Agriculture is big business in the Treasure Valley. Area farmers produce a wide variety of crops including hops, award-winning wines, onions, mint and the great Idaho sugar beet. While the sunny climate and availability of irrigation water contributes to the bountiful harvest, the quality of the soil is paramount. Protection and improvement of the soil has captured the attention of organizations around the Treasure Valley, and they’re working with area farmers to study soil health and implement best management practices. 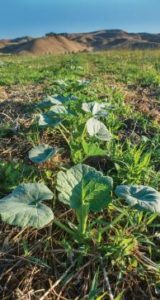 One study focused on the use of cover crops. Cover crops can prevent erosion and increase organic matter in the soil, improving water infiltration rates and sequestering carbon. Using Conservation Innovation Grant funding from the Natural Resources Conservation Service, the Ada Soil & Water Conservation District (Ada SWCD) followed three local producers as they integrated new planting methods and cover crops into their farm management plans. The study monitored erosion rates, soil health, and costs/profits. Conventionally tilled and planted fields were compared to fields where seeds were planted with a no-till drill that eliminates soil disturbance. 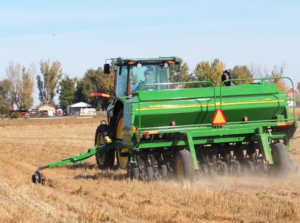 The no-till fields showed reduced rates of erosion and reduced phosphorus output, having a direct benefit on water quality in the Snake River. The no-till fields also had a higher water infiltration rate with a corresponding reduction in dry areas. Each no-tilled field also showed improved soil health; the percent of organic material increased. The no-till plots required less tractor work that saved fuel and time. The producers were also able to use less fertilizer. This all added up to cost savings. In the case of grazing, using cover crops in place of winter feed saved farmers hay costs and time while improving their soil for the next year’s crop. Two short videos about the study can be viewed here. The Ada SWCD has also implemented a grant program to support local soil protection and improvement projects. Two grants have recently been awarded. The Treasure Valley Food Coalition soil education project is teaming with universities to offer programs to students and the public. The spring programs focus on soil structure and the reliance we have on healthy soil. Fall programs will focus on the mycorrhizae in the soil and how to help them flourish. Horses for Clean Water is partnering with the Idaho Equine Hospital to offer courses that focus on animal and pasture health. They focus on proper land management, including mud and manure management, proper grazing, and land stewardship to protect the natural resources around your property. Read more about soil health in this BREN blog by Erin Brooks, Natural Resources Conservation Service.